The Buford Trading Post is the only brick and mortar retailer in the U.S. for Vietnamese PhinDeli Coffee. 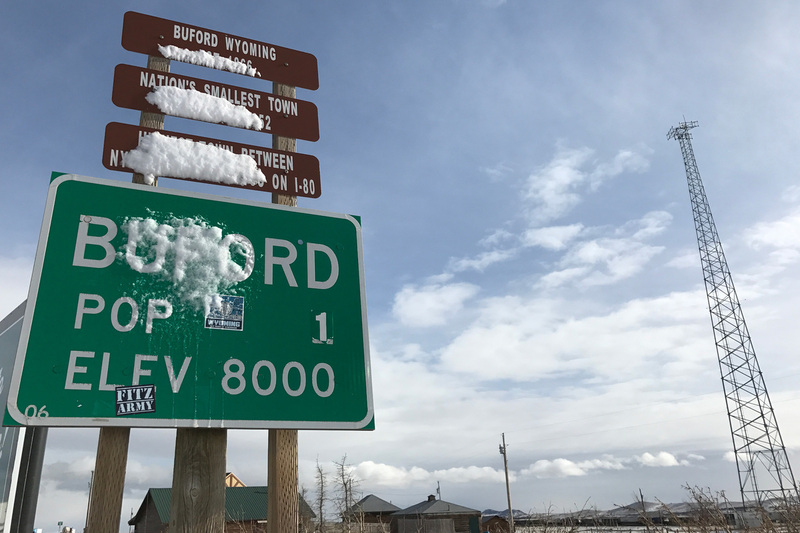 Along a snowy highway in the Rockies lies Buford, Wyo., elevation: 8,000 feet, population: one. This tiny town is in danger of losing its last — and only — resident, as the town's longest running business may have to close. But this is really a story about three people. The first is Jason Hirsch, Buford's town manager. He mans the Buford Trading Post, which is also the gas station, the store and well, town hall basically. Jason Hirsch, the town manager, inside the Buford Trading Post. Buford was named after General John Buford, a Civil War general. "The politics are pretty easy around here," Hirsch says. "Sometimes you know, you have arguments with yourself." Now despite his role as town manager, Hirsch is not the town's one resident. "I live about three miles south of here, so I like to say I live in the suburbs of Buford," Hirsch says. He leases this tiny little enclave with its very own zip code. The owner — stay with me — is actually a Vietnamese investor named Pham Dinh Nguyen. He's the second character in this story. "Yeah, he bought the place for the sole purpose of promoting his coffee," Hirsch says. Nguyen made international news when he bought Buford a few years ago in an online auction for $900,000. 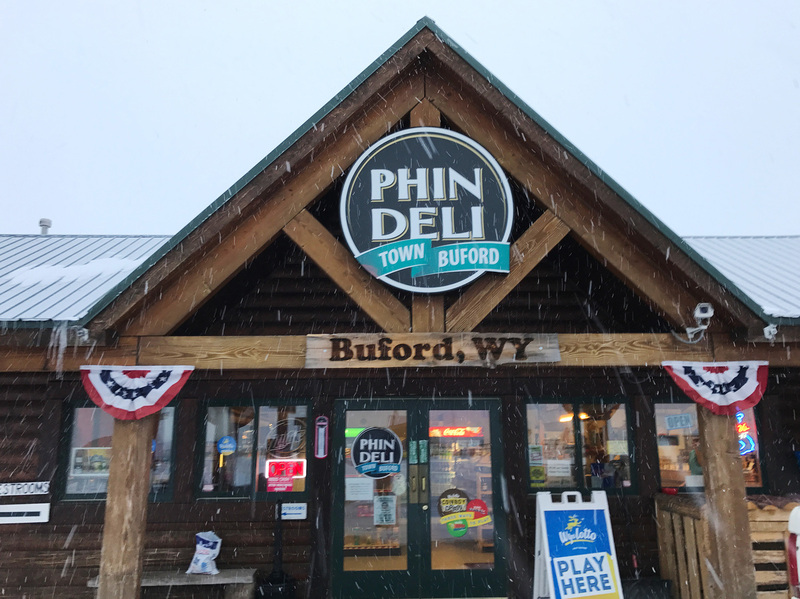 Buford is home to the only store in America where people can buy his PhinDeli Coffee. "He wears a cowboy hat around town in Vietnam and people call him the mayor, " says Hirsch. "He is very famous for owning the smallest town in America." In the store, the usual Wyoming convenience store staples line the shelves. There's the jerky, the chips, the Coors Light — and then there are bags and bags of Vietnamese specialty coffee. Buford, Wyo. is known as the smallest town in the U.S.
"We have what's called Giot Dang — that's their gourmet coffee," says Hirsch. There are four other flavors, including a new mocha blend. It's strong and a hit with the truckers who pass through. There just aren't enough customers to last through the long, slow winter. Hirsch is trying to work out a deal with the owner to stay open until summer, but for now he says it's pretty week by week. "I grew up, born and raised on this mountain, so it's in my blood," Hirsch says. 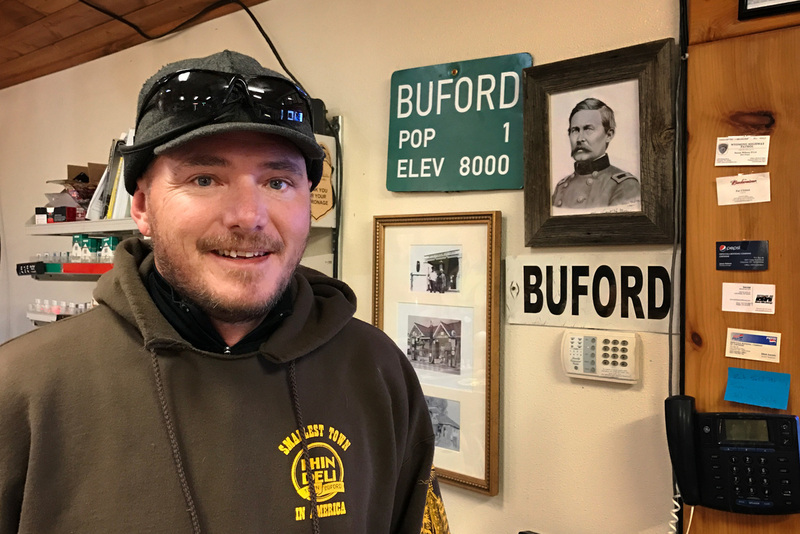 "I love Buford and if there's anything I can do to keep it open I would love to do it. It's part of me." But if the Trading Post shuts down, so does the town. In its heyday, Buford, an old railroad town, had a couple thousand residents. Later came the highway workers when the old Lincoln Highway — one of America's first coast to coast routes — was built. That's now Interstate 80 and most of the maintenance crews who used to call Buford home have moved on. "It's been around since 1886, right. I mean why end it now?" says Brandon Hoover. Hoover is the one actual resident of Buford. He's the third character in this story. He just took a job running the place and living here full time. "Solitude is my attitude," Hoover says with a laugh. Outside in the biting wind, Hoover gives the full tour of the sprawling metropolis. Brandon Hoover, the one human resident of Buford, gets ready to feed Sugar, the unofficial town mascot. "Alright, we got the highway right next to us about 30 feet that way," he says. There's the office back here." 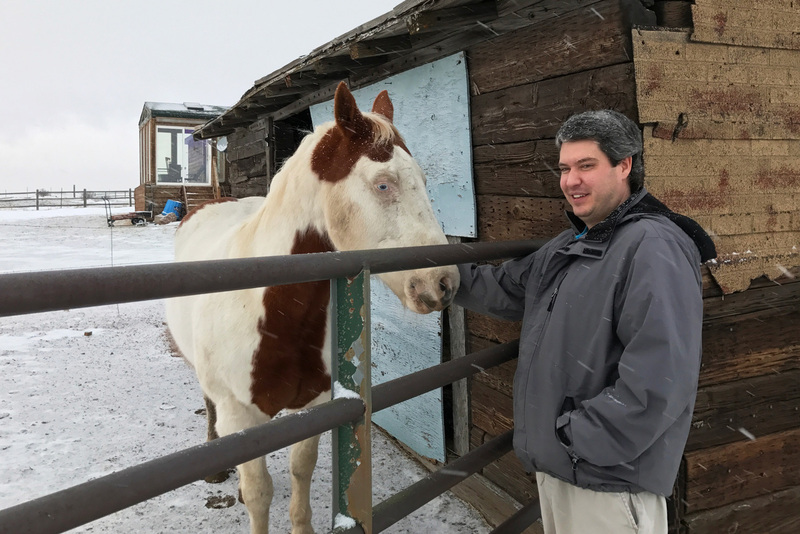 For Hoover, it was a no-brainer to quit his job at the Candlewood Suites in Cheyenne, 30 miles down the mountain from here. "I was looking for just a way to get out of the rigamarole, get out of the rat race and just be able to regain my whole sense of perspective and sense of what this land will give you," Hoover says. But for now, his mind is on his chores. "Let's see if we can find Sug," he says. Hoover calls out, 'Sug, where you at?' "
Buford's population is technically two. The town comes with a horse, Sugar — and it's his dinner time.